Sept. 11 First Responder Still Fights For Care For Others Who Were There : Shots - Health News Demolition supervisor John Feal was working at ground zero 16 years ago when an 8,000-pound piece of steel crushed his foot. After being denied medical compensation, he became an advocate for others. Firefighters work beneath the vertical struts of the World Trade Center's twin towers, in Lower Manhattan, following the attacks of Sept. 11, 2001. 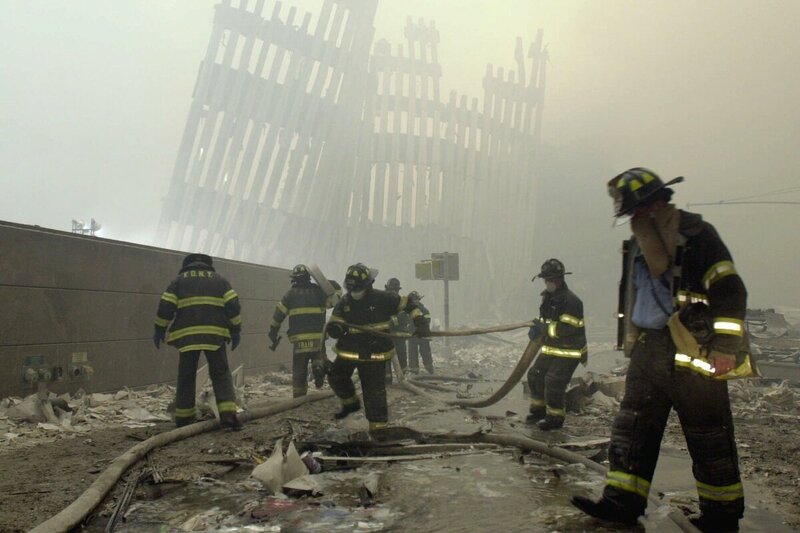 Following the attacks of Sept. 11, 2001, first responders rushed to ground zero in Manhattan, where they braved dangerous conditions to rescue people buried in the rubble, retrieve the remains of the dead and clear the debris. Among them was demolition supervisor John Feal. Feal arrived at ground zero on Sept. 12; just five days later, he was seriously injured when an 8,000-pound piece of steel fell and crushed his foot. He became septic from the deeply infected wound, and nearly died. The accident cost Feal half his foot — and his job. His despair grew deeper when the government denied him medical compensation for his injury. Speaking with other first responders, Feal realized that he was not alone. Not only were others also being denied money to help pay for their injuries and illnesses, but the trauma was ruining people's lives. "They were losing their homes," he says. "They were getting divorced, or separated, or their kids were in rehab for drugs because Daddy or Mommy were miserable." Feal formed the FealGood Foundation, which advocates on behalf of emergency personnel. He also began working to pressure Congress to pass a bill that would provide compensation for medical care and monitoring for first responders. On Dec. 22, 2010, the James Zadroga 9/11 Health and Compensation Act was passed. Looking back, Feal thinks about the injury he suffered at ground zero with mixed emotions: "At the time, it was devastating. It altered my life and I thought it was for the worst. But I look back now and it gives me a chance to show everybody how my mother raised me, so I'm thankful." Roughly 8,000 pounds of steel crushed my left foot. ... I jumped and I didn't get all the way out of the way. It caught my left foot. The guy next to me fainted, because the blood was shooting out of my foot about 6 feet in the air. I made a tourniquet. ... I took his belt off and I made a tourniquet below my knee. 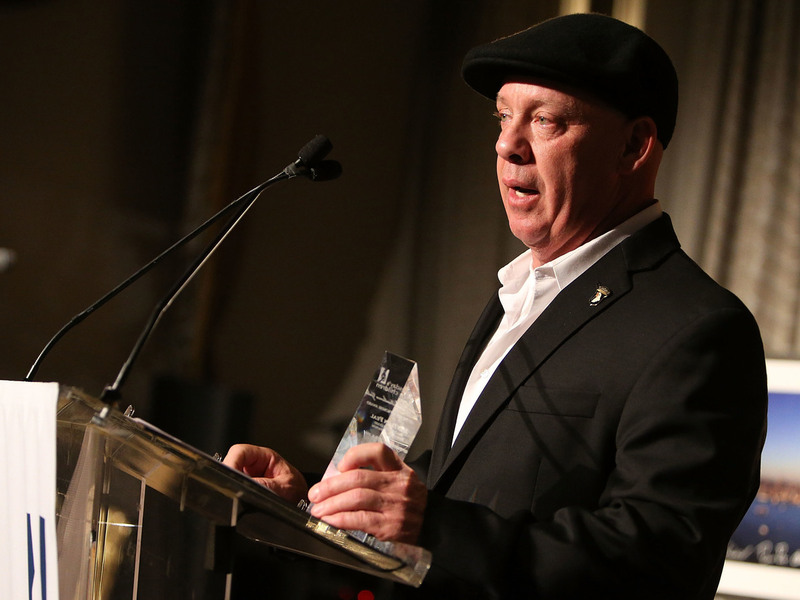 John Feal has received recognition nationally for his work helping first responders get medical compensation and other support for the trauma, illnesses and injuries they suffered from their work related to Sept 11. Before 9/11, in my mind, I was the world's greatest athlete and I was John Wayne. I was that cool. I didn't think I could even be hurt — and that was a rude awakening for me, physically and mentally. But I was able to get to safety. ... By that time the fire department was there and they put a towel in front of me, I was yelling at everybody to get back to work — "I'll be back in an hour," you know — and it was a very humbling experience. I can block out my injury. I can block out my five days there [at ground zero]. I can't block out the smell. Probably why I don't sleep enough. When I close my eyes, I can smell ground zero. Everybody always asks what [did] it smell like? There's not a word invented yet that describes the smell of ground zero. ... It's a smell that I've never smelled before or [since]. It's a smell of destruction, devastation, carnage. It was everything combined in one that created the smell. It's not just me saying this. This is other 9/11 responders and first responders or volunteers who will say the same thing. Especially this time of the year, when I shut my eyes, that smell comes back and it's like it's putting its hand over my mouth and nose, and it gets tough. This time of the year, this anniversary ... it's tough. Not just for me — it's tough for all 9/11 responders and volunteers and survivors and people who lived and worked down in ground zero. They call these "scars" — they're not scars, they're scabs, and these scabs get pulled right off round this time of the year. It's tough. You know, when I was going to therapy back in 2002 and '03 and '04 and '05, I had these same recurring nightmares ... where I would see the plane crash; and one day I'd be sitting on a park bench with my dog, the plane would be driving by and I couldn't do anything. Then it was personal. The next day I'm sitting on the park bench with my dog and I would see my mother in the window of the plane waving. Then, little by little, after doing therapy, I was able to get off the park bench and get up and, like Superman, stop the plane from crashing into the building. And then I was telling people about my experience on workmen's comp or social security, and I started helping them. And I started going to their hearings. And then, the next thing you know, I started taking other Sept. 11 responders to somebody else's hearings, and then the judges and the lawyers were like, "Oh here comes Feal, with his crew!" I look back and it was primitive, but it was effective. Again, at the end of the day I don't apologize or second guess myself, because we're talking about human life. We're talking about human beings who are trying to put food on their table for their kids, or pay their utilities, or put gas in their car to get to a chemotherapy appointment. So it didn't matter what elected official or what lawyer or what judge or what doctor I pissed off, because the only thing I care about at the end of the day is helping people. I'm not so much into all that biblical religious stuff, but I do believe there's a God. I believe we're here for a purpose, and I believe when we leave there's also a purpose. I think our energy goes to other people and our energy continues. I'm not afraid of dying, no. Listen ... I went to therapy when I wanted to kill myself after getting out of the hospital; those thoughts creep up. I do have my bad days. Would I do it? No. Am I strong enough to stop myself? Yes. But I am not afraid to die, and there are times where I wish I would have died instead of a friend or somebody who left behind four kids. I begged God — my God -- to take me instead of them. We call ourselves the greatest nation in the world. But yet we have a strange way of repeating history, and letting veterans come home from war, or 9/11 responders, or just responders now across the nation, how they sacrifice themselves and then we don't take care of them. That's sad. Amy Salit and Thea Chaloner produced and edited the audio of this interview. Bridget Bentz and Molly Seavy-Nesper adapted it for the Web.